FYI SOUTH Magazine, June 2006. Nowadays, Madou is something of a backwater. A town in the center of Tainan County, it's neither especially large nor busy, and it isn't on the main north-south railroad. However, it has an unusually long history and an abundance of cultural and architectural attractions. The town's name derives from "Mattau"--the name given to this place by its original inhabitants, members of the aboriginal Siraya lowland tribe. Tourists usually come here to see the Five Kings Temple (built in 1857), or to sample the area's famous pomelos. Pomelos have been grown in Taiwan for more than 300 years. Madou wasn't the first district to grow them, but they thrived here as soon as they were planted. Some of Madou's pomelo trees are 100 years old. Madou's Japanese-era movie theater, at 110 Jhongshan Road, is easy to miss. At first glance, it looks like many of the town's old two-floor commercial buildings. But on closer inspection you'll find two small windows where movie tickets were once sold. The theater was opened in 1937; sadly, the building is no longer in use. 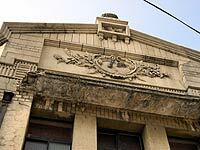 There are many more Japanese-era buildings along Jhongshan Road and Singjhong Road. Several are in excellent condition, but often the relief decorations--a pair of rabbits here, cherubs there--are obscured by advertising billboards. Madou used to be famous for its pickles. Huge pickling barrels--each one around two meters tall and at least 1.6 meters in diameter--gave off strong, salty smells. 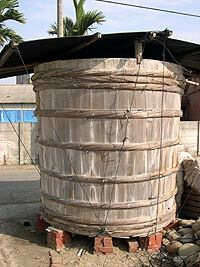 A few such vats are still in use, especially in ShienCai Lane (officially RenAi Road, Lane 29). But if you're hungry, a better bet is the Matsu Temple Covered Food Court, where more than a dozen vendors sell different snacks and dishes. The food court has entrances on JhongShan Road and GuangFu Road. Madou can be reached by the old freeway, or by Taiwan Highway 19-Jia. There are frequent Singnan Bus Co. services to and from Tainan.